Royal Canin Veterinary Care Nutrition ranges are precisely formulated for specific needs. Please speak to your vet about these products. 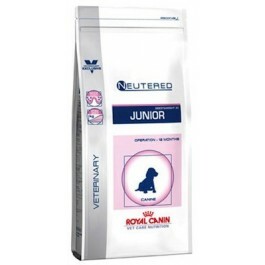 Neutered Junior is a complete feed for medium breed puppies (adult weight 11-25kg) with a tendency to gain weight or skin sensitivity. Suitable for puppies from neutering up to 12 months old. Nutrients which support hair growth and coat shine. Helps promote optimal growth and avoid excess weight gain. Ingredients: Maize, dehydrated poultry protein, dehydrated pork protein, animal fats, wheat flour, rice, barley, hydrolysed animal proteins, beet pulp, wheat gluten*, minerals, vegetable fibres, fish oil, soya oil, psyllium husks and seeds, fructo-oligo-saccharides, hydrolysed yeast (source of manno-oligo-saccharides), borage oil, marigold extract (source of lutein). Nutritional Additives (per kg):Nutritional additives: Vitamin A: 17300 IU, Vitamin D3: 1000 IU, E1 (Iron): 44 mg, E2 (Iodine): 3.4 mg, E4 (Copper): 9 mg, E5 (Manganese): 58 mg, E6 (Zinc): 190 mg, E8 (Selenium): 0.08 mg - Preservatives - Antioxidants. Analysis:Protein: 30% - Fat content: 17% - Crude ash: 6.7% - Crude fibres: 2.6%.